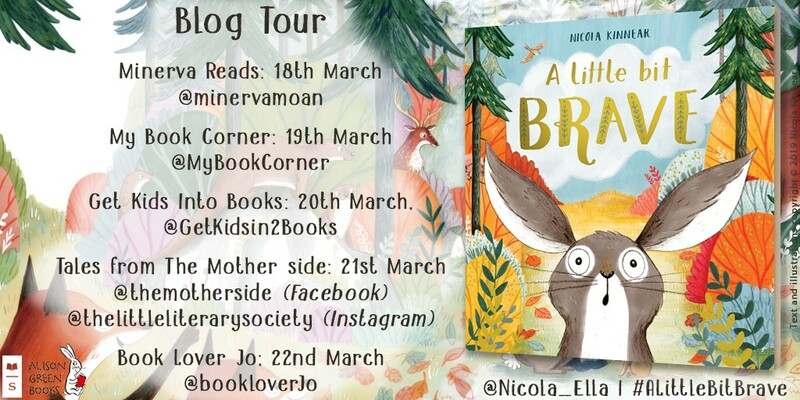 Today I am delighted to welcome Emma Lazell to the blog for a special Q & A to celebrate the release of her hilarious debut, ‘Big Cat.’ It tells the story of a little girl called Isobel who stumbles across an unusually large cat in her grandma’s garden whilst looking for grandma’s glasses. Unfortunately without her glasses grandma fails to spot that this big cat is in fact a tiger and invites him to stay much to her other moggies dismay. Isobel thinks this new pet is so much more fun than her grandma’s other cats but he’s causing chaos wherever he goes and devouring everything in site. Brilliantly told with bold, vibrant illustrations this is bound to delight and entertain young children. Each spread is intricately drawn inviting the reader to pore over the spreads time and time again. It has a retro look that really appealed to me despite being placed in a modern setting. Emma has created a lively and funny debut that left me with a huge smile across my face. My first degree was a BA in Illustration at the University of the Creative Arts. Following this I worked as a teaching assistant, playing a big part in the school’s art department and leading art clubs and events, and alongside this I spent my time writing and illustrating little stories inspired by the children I worked with, and also taking on some freelance work in illustration and design, including stationery illustration and rebranding projects. Following this I went part time and opened up a children’s art party business, which I ran for a few years before moving to Cambridge to start the MA in Children’s book illustration, this had always been the dream! I had an amazing time on the MA, being inspired by the exceptionally talented staff and peers, and really found my way of working. I had a huge blown up illustration of Big Cat at my stand at our MA graduate show at the beginning of 2018, which was spotted by Neil at Pavilion, and over the course of 2018 turned into my debut book. Soon after I met my agent Alice, of Madeleine Millburn literary agency. I now spend my time drawing and writing and planning new projects, and I am looking forward to being involved in lots of book related children’s events over the course of 2019. My work is a mixture of hand drawn line, handmade textures and digital colour. I rarely stay inside of a sketchbook, and prefer to work onto scraps of card and paper that can easily be scanned in. I draw using dip pens, fine brushes, fineliners and soft black pencils, and then create layers of texture using Indian ink and black watercolour which I scan in separate layers and assemble digitally, using Photoshop to alter the colours. Then I layer on more vibrant colour using digital brushes. I have a studio in my garden in Cambridge, which is often invaded by my cats, but I try to also get out and draw or write on location, or in cafes with friends. What gave you the idea for Big Cat? My Cats! Big Cat started out as a story all about an oversized domestic cat, based on my naughty cat Ruby. It was a few drafts on that Big Cat became… without revealing any of the story… the Big Cat that he is. There are three moments I really like in Big Cat: the big tiger reveal at the end for its saturation of orange; the tiger tea party; and the moment where Isobel realises how fun Big Cat is, compared to grandma’s other cats. How did you select the names for your characters? I didn’t have a particularly difficult job here, as my main characters have very self-explanatory names: Grandma and Big Cat. Isobel, the little girl, is named after my younger sister, although her name doesn’t actually appear in the story. What books did you love most as a child? 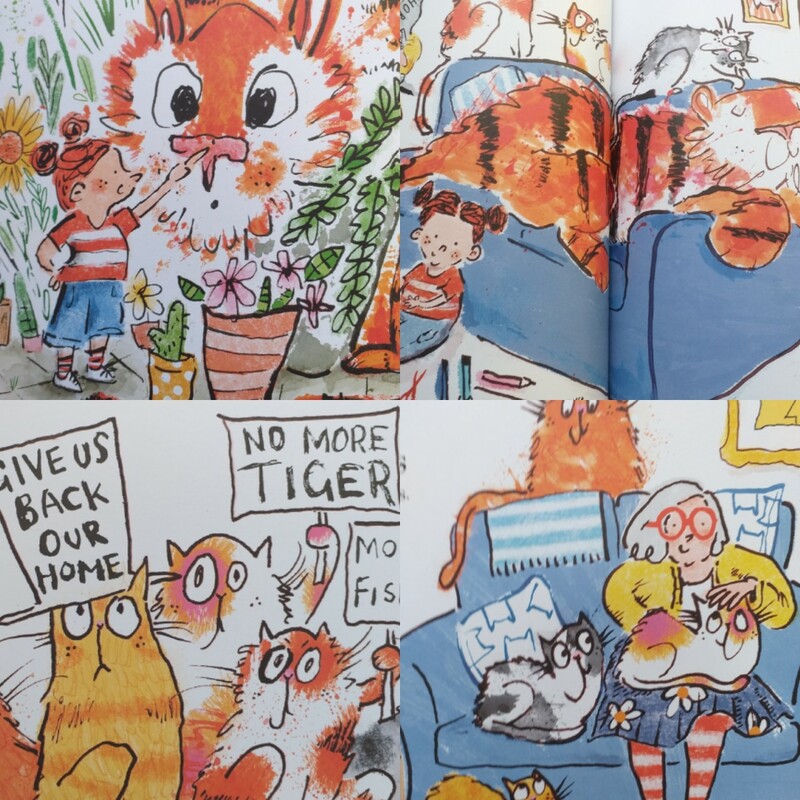 Certainly Judith Kerr’s The Tiger Who Came to Tea, but I think this love is very evident in Big Cat. Growing up I loved We’re Going on a Bear Hunt, and I can still recite it by heart to this day; Michael Rosen’s poetry, which I can fondly remember my primary school headmaster reading us in Friday assemblies; Pat Hutchins’ The Very Worst Monster – I think this says something about the kind of big sister I was! And I also love Francesca Simon’s Horrid Henry series. Which illustrators or artists are you inspired by? Standout inspirations for me are Quentin Blake, Roger Duvoisin and Tony Ross. I love their confident and expressive use of line. I think discovering Duvoisin as a student was a turning point for me in my work, I suddenly felt I could be so much more free with my line, and could achieve everything I wanted purely from a great and confident line. Contemporary illustrators I love are Helen Stephens, Maisie Paradise Shearring, Laura Hughes, Isabelle Arsenault and Becky Cameron. I love illustrators who work really freely and expressively, and I am so inspired when an illustrator is confident enough to share their earliest and roughest sketches. I’m also really inspired by fine art; I love the fauvists, I think they inspire my bold colour palettes. My favourite painting is Matisse’s La Bonheur de Vivre, and again I am so inspired by its vibrant colour palette. Are you working on a new book or any other projects at the moment? Yes, I am, I am working with Pavilion Children’s on a new book, due out Spring 2020. It’s top secret at the moment but I can say, if you quite liked Big Cat but you’re more of a dog-person, then this will be the book for you! Thank you to Emma for this really insightful and interesting Q & A. 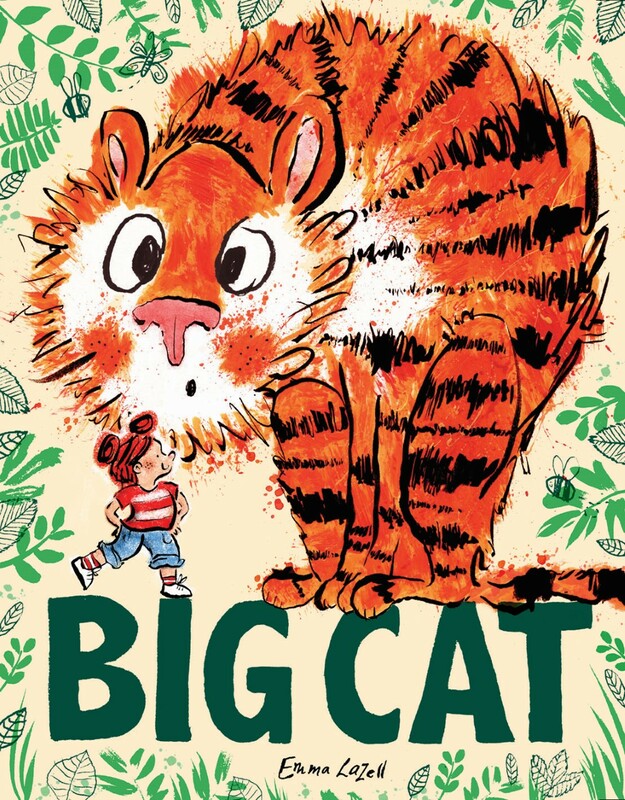 ‘Big Cat,’ is available to buy now online and from any good bookshop. Thank you to Catherine and Pavilion for inviting me to host this Q & A and for sending me a copy of the book in exchange for an honest review. This entry was posted in Uncategorized on April 11, 2019 by bookloverjo. Jennifer Killick is back with a bold and brilliant new series which confirms her talent as a truly original storyteller. 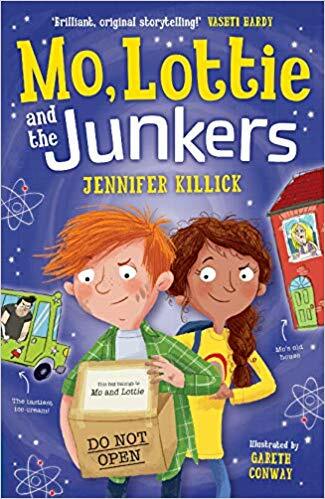 Combining my two favourite genres mystery and sci-fi, ‘Mo, Lottie and the Junkers,’ is a thrilling and compelling read, that will leave you desperate for more. Mo Appleby’s life is turned upside down when he and his Mum move to a house across the road to live with his new step family. Appalled at having his carefully organised collection reduced to one singular box, Mo is completely out of sorts. Things go from bad to worse when peculiar things start happening all around him that he can’t logically explain. It all seems to start with the strange lady who has moved into his old house but she is only the beginning, he is soon surrounded by the most oddest of people. Together with his new step-sister the formidable and feisty Lottie, they must to put together the pieces of this peculiar puzzle that might hold the key to the disappearance of Mo’s dad. Never giving up or doubting their mission even when it seems their findings can’t possibly be true. The problem with uncovering the truth is that it can lead to serious danger. Can Mo and Lottie evade the sinister villains before its too late to save them? It is so difficult to write a review of this book without giving away any spoilers so you will have to bear with me. Jennifer has created a truly outlandish yet completely plausible story that will leave you wondering about all the strange people you encounter in life. Completely mind-boggling in it’s content with some truly squeamish moments for anyone like me who has a weird eye phobia, this story will keep you on your toes with its numerous twists and turns. I think it was really brilliant of Jennifer to set this book within a blended family without it being the main theme of the story, this is just where the action happens to take place. It’s so important that children see themselves and their families in stories and I think Jennifer deals with the adjustments and problems thoughtfully and sensitively. I have to give a shout out to Gareth Conway for his vibrant and energetic cover which hints at the chaos and confusion that lies within the pages. Packed with peril, bursting with bonkerness and outstandingly original this book is a total joy from start to finish. Thank you to Firefly for sending me a gifted review copy in exchange for an honest review. ‘Mo, Lotters and the Junkers,’ is released on April 18th and is available to pre-order online and from any good bookshop. This entry was posted in Uncategorized on April 10, 2019 by bookloverjo. While there seems to be an emergence of a huge range of illustrated fiction for younger readers at the moment, I’m still struggling to find enough books for my emerging readers at school. There seems to be a trickle of books starting to come through for those children who are not quite ready to take on middle grade reads because their length or content may be overwhelming. Today on the blog I’m sharing my recent reads of books that bridge the gap brilliantly between illustrated fiction and middle grade. All of these books are bound to delight and engage younger readers and form part of existing or new series, so there is plenty for any eager child to devour. 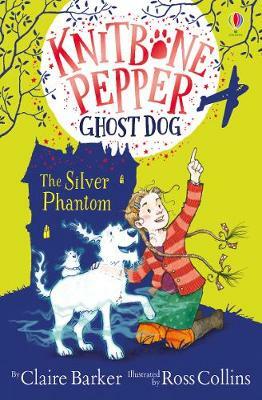 I was overjoyed to discover that there was a new Knitbone Pepper adventure, so it was with very high expectations that I dived into, ‘The Silver Phantom,’ and returned to the bosom of the Pepper family. Never fear Claire and Ross have worked their magic once more and delivered a truly eccentric and magnificent adventure that I truly loved. Knitbone Pepper and Winnie are thrilled when a vintage plane lands at Starcross Hall, bringing with it an unexpected blast from the past. But the visitor is a human ghost who everyone knows bring nothing but trouble and mischief unlike their ghostly animal friends. Along with the cast and crew of ‘Junk Palace,’ chaos and confusion runs rife at the hall, threatening everything the Pepper family hold dear. Can Winnie, Knitbone and the rest of the beloveds get to the bottom of these strange goings on before its too late? Claire’s writing is packed with humour and heart, while Ross’s beautiful, detailed illustrations capture the exuberance and eccentricity of this magnificent story brilliantly. 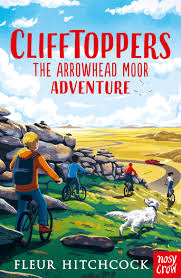 Fleur Hitchcock is better known for being the writer of dark crime stories for older readers but luckily for us she has turned her talents and created the ‘Clifftoppers,’ series. When Aiden, Chloe, Ava and Josh go on holiday to their grandparent’s cottage they experience a world of wild beaches and no curfews, which inevitably leads them to getting mixed up in all sorts of adventures. The first book in this new series ‘The Arrowhead Moor Adventure,’ promises a mystery packed with sinister villains, stolen jewels and a bunch of very smart kids and delivers this perfectly. Containing just the right amount of danger and peril for younger readers, you will find yourself gripped by this race against time to unmask the true criminals before they disappear with the stolen jewels. An intriguing start to this new series and I look forward to joining the cousins on their next adventure. 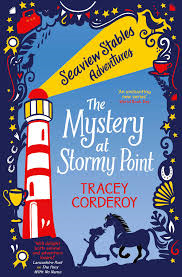 Following on from the charming, ‘The Pony With No Name,’ Tracey Corderoy is back with the second adventure in the ‘Seaview Stables,’ series. Bryony and her family are settling into their new life at Brook Dale, feeling more positive about what their future holds. And with the stables thrown into a whirlwind of excitement in the run up to the gymkhana competition there is lots to look forward to. When Bryony notices a light coming from the abandoned lighthouse at Stormy Point she is intrigued and is determined to discover who is inside. Bryony does love to solve a mystery but has she taken on too much especially with arch-rival Georgina prepared to go to any lengths to destroy her gymkhana dreams. Beautifully written, this story is the perfect mix of friendship and a truly enjoyable adventure. With the ‘Unicorn Academy,’ being an incredibly popular series at school, I felt the need to discover what lies within these pages that has the children coming back and demanding more. Ariana is struggling to settle in at Unicorn Academy and is teased for being timid, unlike her unicorn Whisper who loves the thrill of an adventure. But when animals start to abandon the forest, they soon discover there is a mystery to be unravelled. 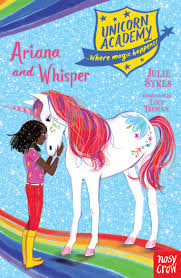 Ariana and Whisper will need all their courage to protect their friends and return the animals home safely. Despite this being the eighth adventure in this series I soon discovered that the Unicorn Academy is a school where you meet your own unicorn and have amazing adventures together, on a beautiful island. There are so many intricate details that unicorn fans will find incredibly appealing from the, ‘Care of Unicorns,’ lessons to the magical bonding that takes place between the child and their unicorn. Enchanting and magical illustrations and writing that will truly delight younger readers. 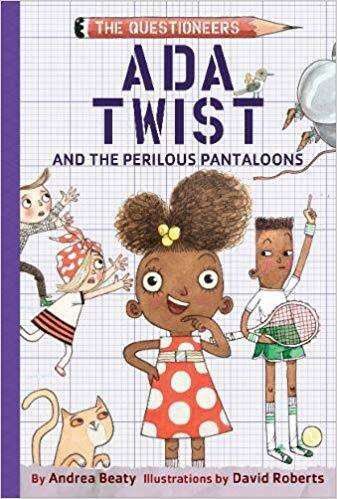 I’m a huge fan of the Andrea Beaty and David Robert’s marvellous Rosie Revere, Iggy Peck and Ada Twist picture books so I was thrilled that ‘The Questioneers,’ would be making their appearance in a new illustrated fiction series. This story is the second book in this series and features the fabulous Ada Twist, the Queen of Questions, whose mind is a never-ending whirr of who, what, why, where and when? Ada knows the only way to get to the bottom of these intriguing questions is to work out the answers by experimenting. When Rosie Revere’s Uncle Ned gets carried away in his famous helium pantaloons, Ada needs some answers and she needs them fast! Together with her fellow Questioneers, can they save the day? Perfect for inquisitive minds, this series delves into the world of science and marvels at it’s mystery. If your child is constantly bombarding you with unanswerable questions then this may indeed be the book for them. Exquisitely produced with sublime illustrations this book is scientifically stimulating and filled with fun. Lou Treleaven is back with the third book in this out of the world series. Jon thought that living seven and half billion kilometres from Earth would save him from the clutches of his teacher, Mrs Hall. 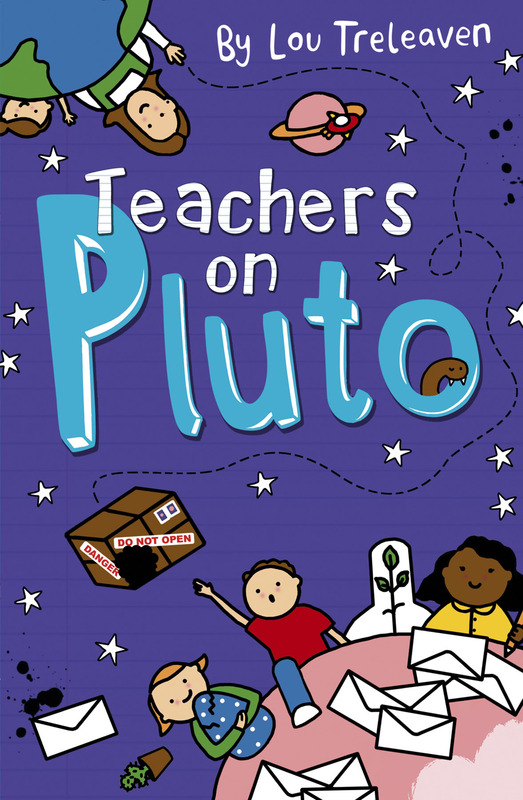 That is until the President of Pluto goes on his honeymoon and puts Mrs Hall in charge of the planet. It soon becomes clear that she is clearly incapable of this job – in Jon’s opinion- creating new ridiculous laws that are more like school rules. Obsessed with upholding these laws, it’s left to Jon and Straxi to take matters into their own hands when they discover a giant, mutant snargler on the loose! I really enjoy the originality of this series, it’s fun and frenetic. The use of letters, posters and robot reports to tell the story is really engaging and different, it’s proved to be a popular series at school. Thank you to Abrams, Maverick, Nosy Crow, Simon & Schuster and Usborne for my gifted copies of these books in exchange for an honest review. All of these books are available to buy or pre-order now online (click title to buy) or from any good bookshop. 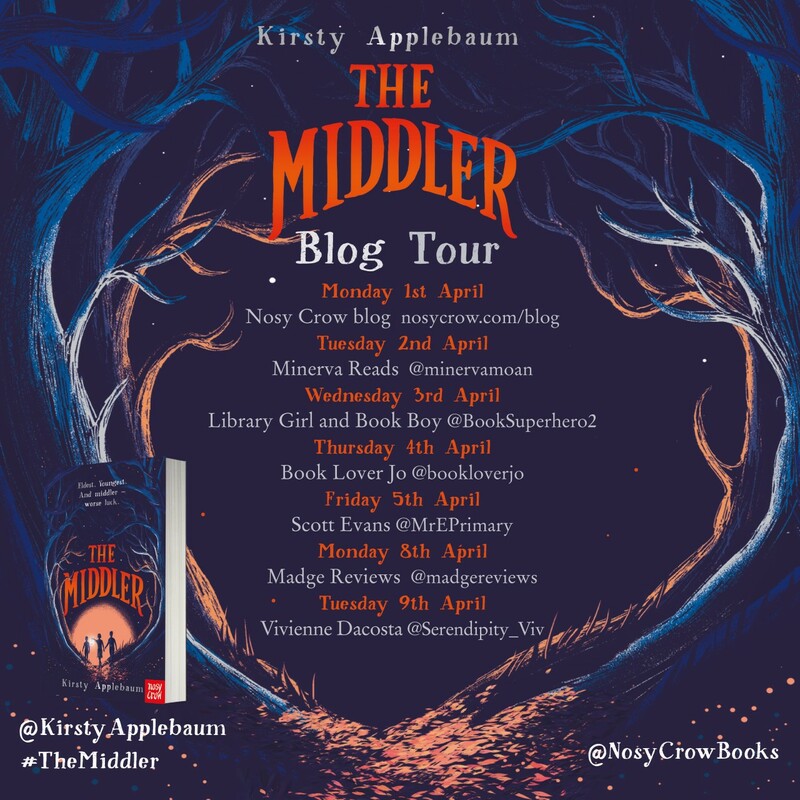 I am delighted to welcome Kirsty Applebaum to the blog today with a special guest post to celebrate the publication of her thrilling, dystopian debut, ‘The Middler.’ Maggie lives in Fennis Wick, forbidden from crossing the boundary because of the dangers that lie in wait from those who would dare to disobey the rules. Born a middle child in a society that only values the eldest child Maggie struggles to find her place in the world. When her brother Jed is sent to fight in the Quiet War, Maggie feels even more unsettled. A chance encounter with Una, a hungry wanderer exposes her to some uncomfortable truths. This is a compelling and uncomfortable tale of forbidden, friendship, loyalty and betrayal that will hold it’s grip on you to the very last page. Brilliantly told, full of twists and turns this tale is a feast for your imagination with it’s highly believable dystopian world. Superb characterisation meets intriguing storytelling, a truly exciting debut from Kirsty. She is definitely one to watch for in the future, a real rising star in the middle grade world. 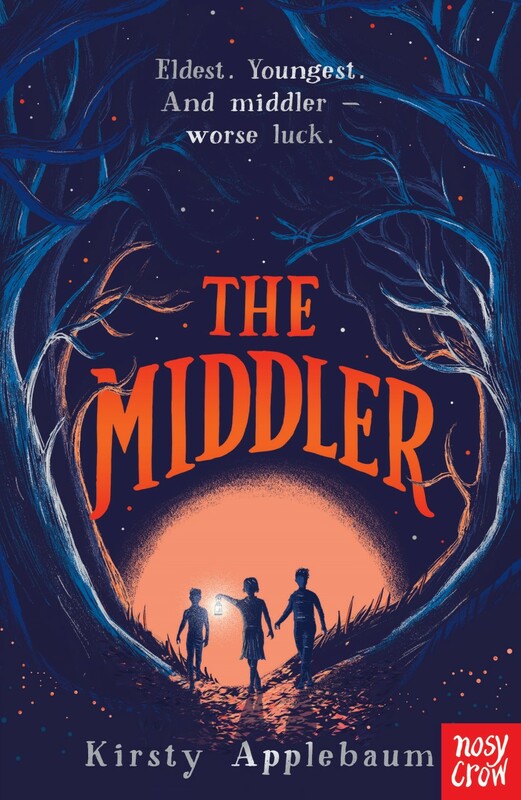 The Middler tells the story of 11-year-old Maggie, a middle child living in an isolated community where only the eldest children are special. Maggie lacks confidence and feels that other people are more important than her. Unable to take brave, assertive action at the beginning of the book, she starts small, helping someone in need. Gradually her deeds become bigger and braver – and by the end of the book she has changed her life. When I was young, I didn’t dream of being a writer. I lacked confidence, just like Maggie. I did write, though. And I started small. At primary school, I made up short stories about a witch called Witch Mabel. She rode a motorbike instead of a broomstick. At secondary school, I wrote poetry and songs. One song was for a science competition. My friends and I made a recording and were invited to perform at a regional event. It was only when I had my own children that I thought I’d like to write more seriously. We loved reading rhyming poems together, such as Hilaire Belloc’s Cautionary Tales – and I began to write poems like this too. One was about a boy called James Sebastian McFlue, who hatches a plan to persuade Santa to leave him extra presents. I took courses: a local creative writing class; an Arvon course; and then the Bath Spa MA in Writing for Young People. By the end of the MA I had written The Middler. Nancy Miles, my lovely agent, contacted me after reading the opening chapters in the MA anthology, and together we found a wonderful publisher in Nosy Crow. – been told (quite rightly) that early drafts of my writing were boring/unsellable/heading in completely the wrong direction. But, just like Maggie, I started small and kept going. Gradually my confidence grew and my writing became bigger and braver and better. Now my first book is being published, and I’ve changed my life. 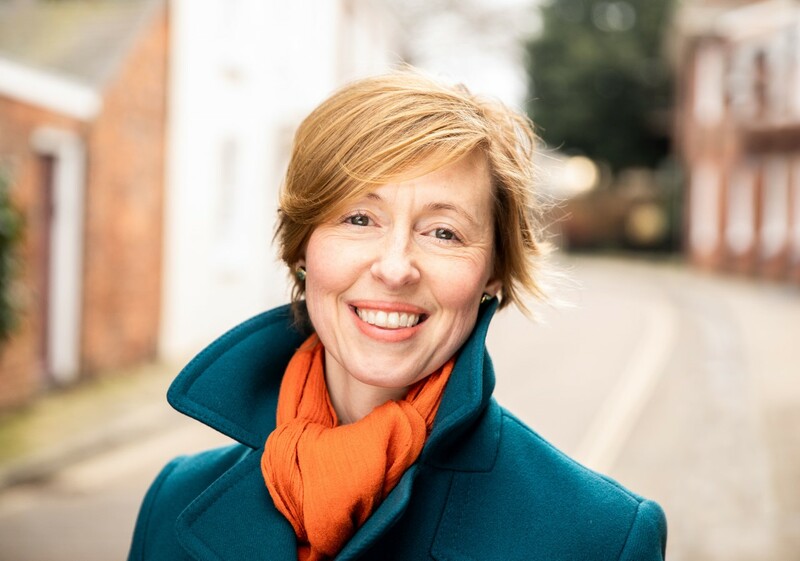 Thank you to Kirsty for this insightful blog post, which will provide inspiration to all those inspiring writers out there. Thank you to Clare and Nosy Crow for inviting me to take part in the blog tour and for sending me a gifted copy of the book in exchange for an honest review. ‘The Middler,’ is available to buy now online or from any good bookshop. This entry was posted in Uncategorized on April 4, 2019 by bookloverjo. When I first shared the opening pages of ‘Everdark,’ to a spellbound group of children at school, I knew that Abi Elphinstone’s ‘ The Unmapped Chronicles,’ series was going to be incredibly special. I fell in love with the remarkable idea of a world created from Phoenix tears and was intrigued about the hidden unmapped kingdoms. 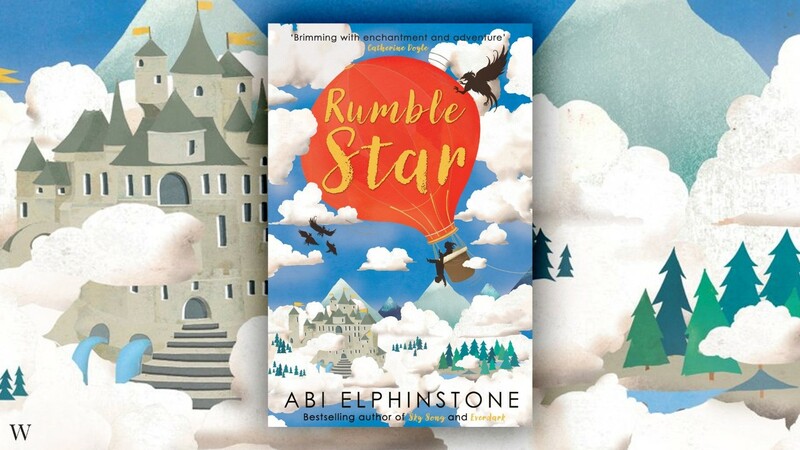 It felt like a world of adventures was waiting for me within these kingdoms and it gave me a tiny sprinkling of the magic that lies within the first adventure, ‘Rumblestar.’ So I was thrilled to receive an early copy and I wanted to share a sneak peek with you today. I feel that ‘Rumblestar,’ is one of those stories that will be talked about for years to come, it is just the start of an epic journey and I haven’t been this enthralled and excited since Lucy stepped through the wardrobe into Narnia. Casper Tock is a child who lives in fear of the school bullies Candida Cashmere-Jumps and Leopold Splattercash. He spends his life trying to avoid them by using a carefully planned and regimented schedule. But one day a tiny slip up happens and his life changes in the most unexpected of ways. It forces him to confront everything that he studiously avoids, friendship, danger and spontaneity when he stumbles upon Utterly Thankless, her miniature dragon Arlo and the kingdom of Rumblestar. On the face of it, Casper and Utterly have nothing in common. He’s a rule abider while she’s allergic to rules, but they are both nursing a hidden pain – a reluctance to form bonds with others. All Casper wants to do is find a way back home but Utterly’s world is in danger and he soon realises that the fate of their two world are inextricably bound. But how can these two unlikely heroes defeat the dark magic that is pervading through the Unmapped Kingdoms? Abi has created the most magical world filled that feels completely believable, you feel that the grown-ups must have got it wrong and we have closed our imaginations to the truth of these hidden kingdoms. Her writing is wildly imaginative and filled with the most magnificent details, she conjures up the images so vividly as the stories unfolds. We can envisage the cloud giants, storm ogres and drizzle hags who inhabit this world and it makes the reader feel like they’ve stepped into the world and are whisked along beside Casper, Utterly and Arlo. It has to be said that Abi has a unique talent for conjuring up the most fantastical names for her characters and settings, they spark a light of intrigue in the reader and are wonderfully enticing. This feels different than Abi’s other books there is a gentle humour and fun that runs through the story – even in the darkest of times – that I particularly enjoyed. ‘Rumblestar,’ is such a glorious read bursting with bravery, packed with friendship and full of friendship. I can’t wait for next adventure in the Unmapped Kingdoms. 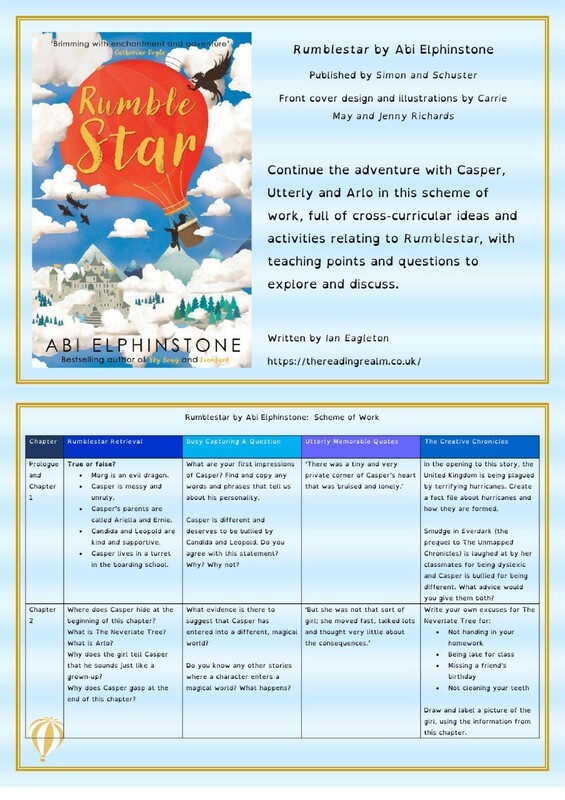 I think, ‘Rumblestar,’ would make a brilliant class read and luckily for any teachers out there who are intrigued by this story Ian Eagleton of @reading_realm has created a thoughtful and interesting Scheme of Work which is available to download for free on Abi’s website (click the link below). I have a sneak peek to share with you. 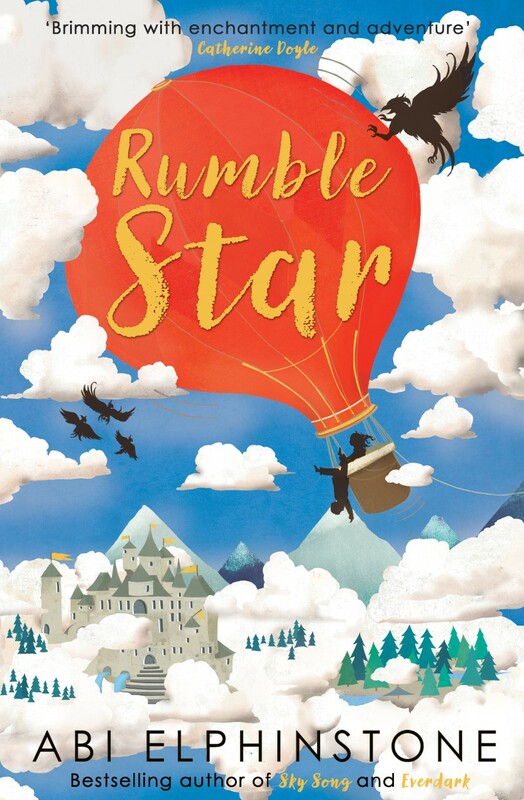 Schools can pre-order discounted copies of ‘Rumblestar,’ from Kensington Books, email Dave@kensingtonbooks.co.uk to find out more. Thank you to Abi and Simon & Schuster for sending me a gifted copy in exchange for a review. ‘Rumblestar,’ is available to pre-order now online or from any good bookshop. This entry was posted in Uncategorized on March 28, 2019 by bookloverjo. 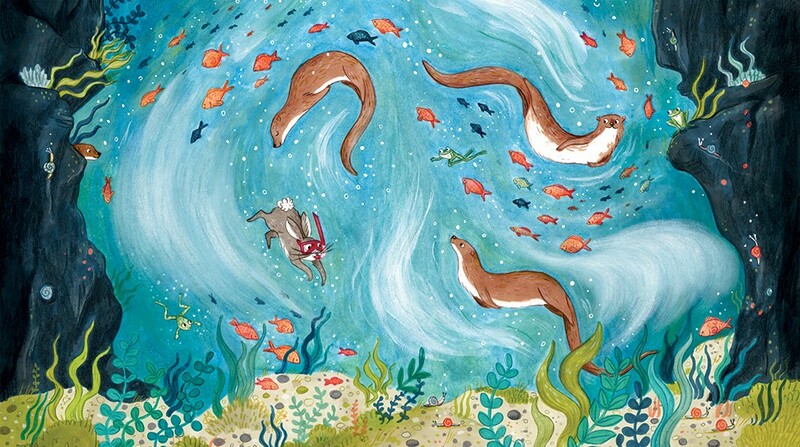 ‘A Little Bit Brave,’ is a glorious picture book debut from Nicola Kinnear that celebrates the joy of overcoming your fears and seizing the day. Logan loves to hear about his best friend Luna’s adventures but likes nothing better than staying at home baking biscuits and watering his plants. But one day Luna loses her temper at Logan’s reluctance to be brave and storms out. Logan is desperately unhappy about upsetting Luna and is determined to conquer his fears. He soon discovers that there’s a whole world waiting outside and realises how much he is missing out on. When he discovers Luna in peril, its time for Logan to be truly brave! Stunningly illustrated this book is so beautiful and thoughtful. It’s the perfect book to share with children who may be unsure about trying new experiences and it’s reassuringly positive even when things go wrong. Sumptuous spreads are filled with the most exquisite details and Nicola captures brilliantly the range of emotions Logan feels on his journey to becoming brave. I particularly love the autumnal palette bursting with colour and life reflecting Logan’s awe and wonder at this world that has been waiting for him. 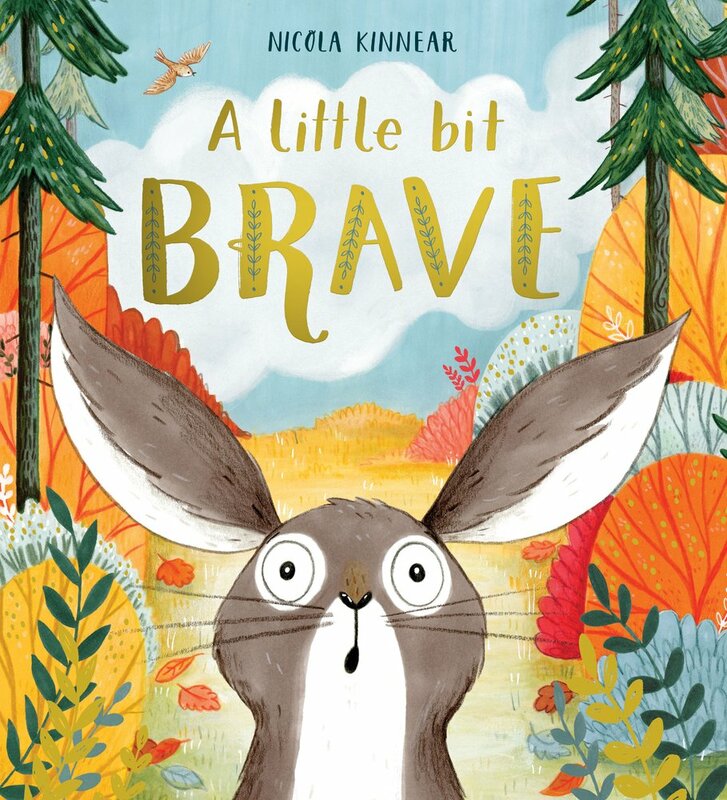 A Little Bit Brave is such a beautifully illustrated book, and Nicola talks about how some of those illustrations came to be. This is one of my favourite illustrations from the book. I settled on the idea for this spread quite early on and it didn’t really change much when I did the final version. 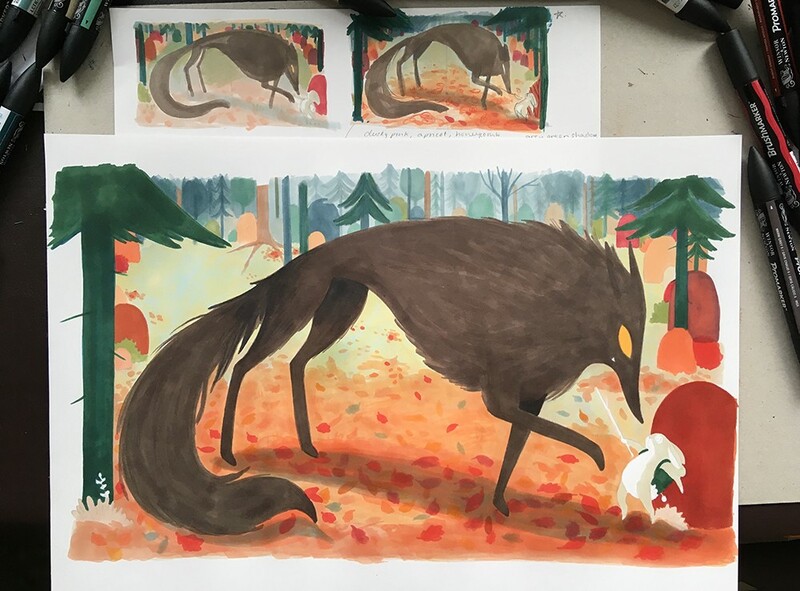 This is a work in progress shot of the illustration with the wolf trying to eat Luna. I keep the colour thumbnails close by to reference while I’m working. I used Promarkers and coloured pencils to do all of the final illustrations. Thank you to Louisa and Scholastic for inviting me to join in with this blog tour and for sending me a gifted copy of the book in exchange for an honest review. ‘A Little Bit Brave,’ is available to buy now online or from any good bookshop. This entry was posted in Uncategorized on March 22, 2019 by bookloverjo. 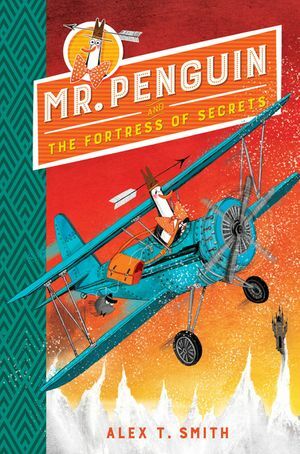 Today I’m sharing with you on the blog ‘Mr Penguin and the Fortess of Secrets,’ by Alex T. Smith which has been nominated for this year’s Children’s Book Awards. This is the second adventure featuring Mr. Penguin and his trusty sidekick the ninja spider Colin. When Mr Penguin and Colin crash land on a snowy mountain in the middle of nowhere in a bid to escape some terrifying criminals, they find themselves smack bang in a very strange mystery indeed. All of the rodent pets in the village of Schneedorft-on-the-Peak have mysteriously disappeared including Colonel Tuftybum whose owners is convinced that something odd is happening. With strange goings on at the fortress and sinister characters lurking in the shadows, it’s up to Mr Penguin to and Colin to figure out the truth and save the day! I loved this snowy and thrilling adventure which features Alex T. Smith’s trademark brilliant humour and unique style. He has a knack for creating the most eccentric and marvellous characters who he brings to life with his intricate and hilarious illustrations. The attention to detail is joyful and wonderfully enhances Alex’s lively tale and the story bounces along at a energetic pace, bursting with red herrings and fish finger sandwich references aplenty. Wildly imaginative with clockwork sleighs and hypnotised snakes, it is bound to captivate younger readers. Containing just the right amount of danger, intrigue and peril for its audience which mixed with the incredibly generous slapstick comedy makes for a hugely entertaining read. I asked Alex how he felt about being nominated for this award. “I am thrilled to be shortlisted in the Children’s Book Award. It’s always lovely to be shortlisted for an award but this is especially brilliant as the award is voted for by the cleverest, most discerning readers out there: kids! To get a closer look at the other books nominated for this year’s Children’s Book Award you can visit the website and join in with the rest of the blog tour. Thank you to Kate and FGBG for inviting me to join in with the blog tour and to Hachette for sending me a gifted copy of the book to review in exchange for an honest review. Your child can vote for their favourite book here! This entry was posted in Uncategorized on March 18, 2019 by bookloverjo.